Come get in touch... with your wild side! Looking for a unique summer camp experience? 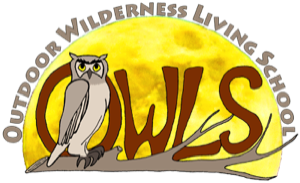 OWLS offers a limited number of pre-scheduled or customized summer camps for individuals, families, and groups such as the boy scouts. Contact us if you would like to schedule a class that meets your needs. We can coordinate with other parents to optimize the experience and timing for everyone’s mutual needs. Two Nights. Ideal for ages 9 to 15. 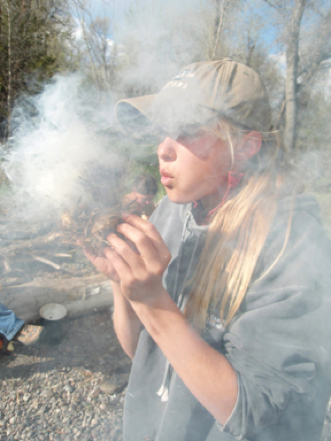 Ancient Skills Camp follows a theme similar to our Classroom in the Woods programs. 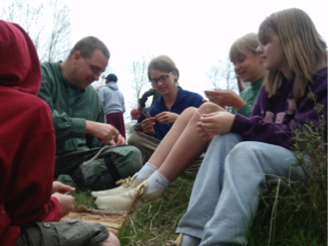 Kids get hands-on experience with primitive skills such as natural shelters, friction fires, ancient cooking methods, animal tracking, stalking of game, native plant uses, basket weaving, bow and arrow making, and other age-appropriate survival skills. Based on our belief in passion-based learning, we play lots of games, and keep the fun rolling all day long! Ever want to go back to camp, or to spend high quality time with your kid? Well, here’s your chance to do both. Sign up with your child and spend time together in a situation away from all the distractions of home and modern society. There will be plenty of chances for bonding on a deep level and playing together in nature. Additional camps may be scheduled by request. 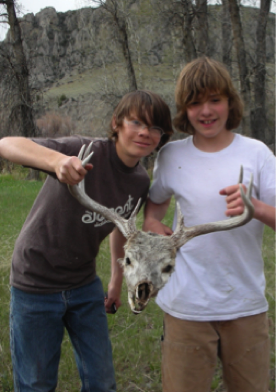 Our Ancient Skills Camps are held at our River Camp facility, along the Jefferson River near Whitehalll, Montana. I just wanted to thank you for putting on the camp. Kaydin had such a wonderful time: he says it changed his life! He is a ranch kid and has always had a love of nature, but you gave him a different perspective that he and I both really appreciate. He looks forward to doing the camp again next year. Three Nights. Ideal for ages 9 to 15. Younger/older siblings may attend with at least one family member in the above age range. Parents and kids of all ages are encouraged to particpate in activities. Bring the whole family for a four-day weekend of outdoor fun, games, and skills! Fall Family Camp fills the gap when public schools close for "PIR days," providing a unique window of opportunity for parents and kids to spend quality time together in the great outdoors before winter settles in across Montana. 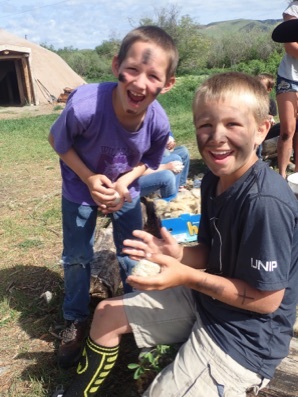 Kids and parents get hands-on experience with primitive skills such as natural shelters, friction fires, ancient cooking methods, grass ropes, felting with wool, animal tracking, stalking game, native plant uses, basket weaving, and other age-appropriate survival skills. Based on our belief in passion-based learning, we play lots of games, and keep the fun rolling all day long! Family Camp is held at our River Camp facility, along the Jefferson River near Whitehalll, Montana. Pay full balance now or send $300 deposit and pay the remainder upon arrival. See the dropdown menu on the PayPal button or send check or money order to the address below.